The pundits, previews and predictions were certain. Based on the form lines and her eye-watering times, Dina Asher-Smith was European 100m champion before she even stood on the startline in Berlin this summer. It took Asher-Smith a little longer to be sure. But not much. “This is going to sound so bad,” the 22-year-old told BBC Radio 5 live. “I knew I had it from the first two steps. That is the bit where there was the potential to give the race to someone else. “If I was looking at seven peoples’ backsides at that point, it would have changed the mental map of that race. It was strong. 10.85-seconds strong. The joint fastest time in the world and an exact match for American Tori Bowie’s winning mark in the World Championships 12 months before. Asher-Smith could have given away that gold medal in those first two steps. She could also have given it away in a deserted grandstand 18 months previously. 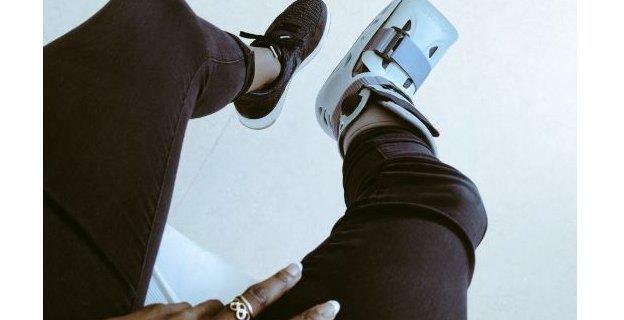 In February 2017, consigned to crutches after breaking her foot in a freak training accident, she was an unexpected attendee at a relay camp where her British team-mates were bonding and honing changeovers. “I could see everyone being nice to me, looking at me thinking ‘ah she’s so cute, she thinks she is still going to make the team’,” remembers Asher-Smith. “Ninety per cent of people thought I wouldn’t make the World Championships, some thought I wouldn’t run for two years. “I wasn’t really down though. I just refused to believe it was over. “If I had listened to them I wouldn’t have even tried to make the World Championships and then I would not have run well this year because I would have started it still in rehab. After she followed up her 100m gold in Berlin with the 200m title and a scorching anchor leg for the victorious 4x100m team, people are thinking a lot of her. Once a kit-carrying volunteer at London 2012’s Super Saturday, she is now is the figurehead for the generation that follows Jessica Ennis-Hill, Mo Farah and Greg Rutherford. Away from the track, she was on the front row of London Fashion Week. At Paris’ equivalent she was on the catwalk itself, alongside heptathlete Katarina Johnson-Thompson. She has shared chat-show sofas with actors and pop stars and one expert valued her fast-talking fast-moving charm at more than a million pounds a year in potential sponsorship tie-ins. “I am not famous,” she insists. “I can get on the tube and nobody talks to me, I’m not famous. “It is weird. I run in a straight line. So many other people do stuff in their field that is at the same level as I am, it is just that my field is the one on TV. “Whether or not I am comfortable with it or intended it, it is what it is. If young people are looking up to me and saying they want to conduct myself like you do then I think I have a responsibility to not be silly really. Living her best life during the current off-season involves talking and eating rubbish with her friends and looking forward to a solo trip to a continental spa resort. “Me and spas are a thing. I love them. I have booked myself in for a treatment every day. I have got this weird milk bath thing, I don’t know how it is going to go, but I thought it is 30 euros so might as well try it,” she adds. Whether under the spotlight in a major championship final or amid the pan pipes and whale song of the treatment room, she is taking nothing for granted. Listen to Dina Asher-Smith’s interview with Darren Campbell on BBC Radio 5 live on Thursday 18 October at 20:00 BST.